I use my Crock Pot all the time for dinner. It is one of the appliances that makes me feel like my life is somewhat together, because it’s the one thing that you can just dump things into and hours later, as if by magic, an entire meal comes out. It was a definite light bulb moment when it occurred to me that if my Crock Pot can make my evenings so easy, I can easily work it overtime to make mornings a bit easier. My four kids make mornings way more hectic than my evenings, anyway. Enter Crock Pot oatmeal. I make a point to make this at least once a week. 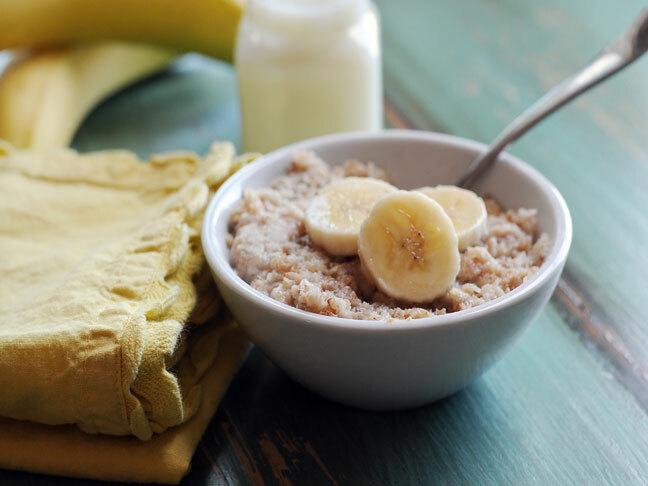 It’s a tasty option for breakfast that cooks up in the Crock Pot while we sleep! You basically just dump the ingredients in, go to bed, and when you wake you you’ll have a delicious, hot breakfast ready to serve. This is my family's go-to breakfast for when I know the morning is going to be absolutely insane. Step 1: Using non-stick cooking spray, thoroughly spray the bottom and sides of the Crock Pot insert. Step 2: Add the old-fashioned oats, water, milk, cinnamon and brown sugar to the Crock Pot. Mix well until all ingredients are well incorporated. Step 3: Cover and cook on the low setting for 8 hours. Step 4: Prior to serving, stir in the mashed bananas. Garnish with additional banana slices if desired.